These pests over winter in protected areas on a variety of plants, and become active as soon as the worst winter cold has passed or even during mild winter weather. 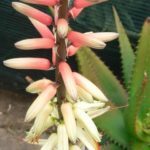 They will aim for the very centre of the aloe plant and may require some close scrutiny to detect. The presence of ants on the aloe is often the first sign of aphid infestation. 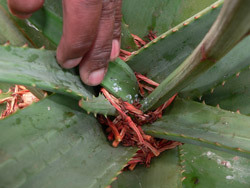 When they have been left unhindered for a few weeks, the aloe reacts by closing the centre leaves in an effort to protect the damaged tissue. This suits the baddies perfectly because it means more hiding place for them. If left untreated aphids can cause severe damage to the new growth, sometimes with rot setting in resulting in the loss of a plant. 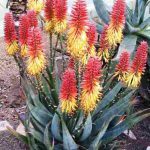 A variety of garden insecticide sprays and powders are effective in controlling this pest, as are some of the organic insecticides. 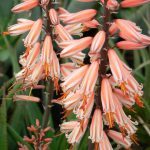 When spraying aloes it is always wise to use a spreading/sticking agent and to apply a very fine spray if possible. Remember to pull the centre leaves apart where they seem to be stuck together, before applying insecticide.